In January, the Dalhousie Archives hosted a researcher who travelled more than 15,000 km from home to access a part of the collection that is central to her work. Prue Taylor is a senior lecturer of law at the School of Architecture and Planning and the Deputy Director of the New Zealand Centre for Environmental Law at the University of Auckland. She was in Halifax to use the Elisabeth Mann Borgese collection held in the Dal Archives. Prue spent four days going through some of the sixty boxes of Borgese’s papers. “It’s taken a number of years for me to get to Dalhousie. I’m thrilled to be spending some time with this collection of international importance,” said Prue. 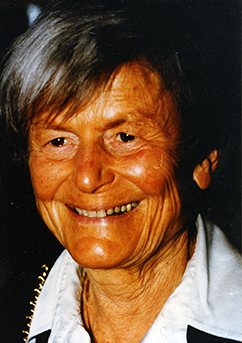 Prue’s work on international environmental law, environmental ethics, climate change, human rights theory, and commons governance have led her to the work of Elisabeth Mann Borgese. Borgese is an important international figure who spent nearly twenty-five years working at Dalhousie. In the 1960s, before she came to Dalhousie, Borgese and Arvid Pardo (then Maltese Ambassador to the United Nations), put forward the revolutionary concept that the oceans are “a common heritage of mankind.” This proposal triggered the negotiations for the United Nations Convention on the Law of the Sea (UNCLOS). Although it was not adopted as a principle of international law for the oceans as an integrated whole, it was codified for the resources of the deep seabed beyond national jurisdiction. 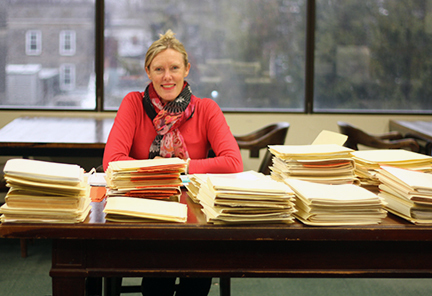 Prue Taylor surrounded by file folders of Elisabeth Mann Borgese’s papers in the Archives & Special Collections Reading Room in the Killam Library. Prue and fellow New Zealand scholar Lucy Stroud recently published The Common Heritage of Mankind, A Bibliography of Legal Writing, which includes legal work available in twelve languages. “For some time, many lawyers and diplomats have held the view that the common heritage of mankind is too utopian and controversial to be used in future international agreements. However, our research for this bibliography demonstrated just the opposite. There is a wealth of interest in the common heritage, much of it buried in legal journals. There has been a renaissance in the common heritage of mankind, and by producing this bibliography we are advocating for and participating in the renaissance,” said Prue. “Dalhousie’s Borgese collection is a hugely valuable and important collection, and when more people know about it, it will be heavily used. An international audience would be fascinated by what you have here. Elisabeth provided an interdisciplinary approach to the common heritage of mankind. Today, that concept can be applied when we talk about climate change, biodiversity loss, and governance of the commons. It has so many contemporary applications,” said Prue. “We have a tremendous legacy here, in form of the Elisabeth Mann Borgese collection,” said Michael Moosberger, University Archivist. “Unfortunately, people aren’t doing as much primary research these days, as more and more people rely on electronic resources for all of their research. That can provide quite a disjointed view of things, without real context or analysis. Not doing primary research also removes the joy and the benefit of serendipitous discovery, which can make primary research such a fantastic adventure,” said Michael. “We’re so pleased that we will soon begin the process of digitizing this collection, thanks to a $100,000 donation from Nikolaus Gelpke, a former Dalhousie student of Elisabeth Mann Borgese. We love hosting international researchers like Prue, but we know that the Borgese collection will reach so many more researchers once it’s available digitally,” said Michael. Prue Taylor isn’t the first international researcher to come to the Dalhousie Archives to use the Borgese collection. In January 2012, two people from the Lübecker Museen’s Buddenbrookhaus came to examine Elisabeth’s papers in preparation for a major exhibit they were mounting in Lübeck, Germany, the birthplace of Elizabeth Mann Borgese, to mark the tenth anniversary of her death. Prue’s visit to Halifax was short due to meetings and other obligations in Ottawa, but she certainly made good use of her time and enjoyed her stay. “It’s been a pleasure to spend these past four days looking closely at Elisabeth’s life, work, and correspondence. Michael and all of the archives staff have been so welcoming, delightful, and friendly. I could not have made the discoveries that I have without their expert help,” said Prue. To learn more about the common heritage of mankind, read The Common Heritage of Mankind: A bold doctrine kept within strict boundaries, by Prue Taylor.